There are many ways to increase awareness about low vision and vision rehabilitation among the communities you serve. You can hold events anytime throughout the year, especially during Low Vision Awareness Month in February. Check out these ideas, including tips for using traditional and social media, and integrate a few into your educational and promotional efforts. Lead an educational session using the Living With Low Vision Educational Module to inform people with vision loss and their friends, family, and caregivers about vision rehabilitation. Distribute the Living With Low Vision booklet and DVD and other eye health education materials in places where older adults and their families, friends, and caregivers gather. Help inform people about vision rehabilitation services and devices. Include contact information for local vision rehabilitation services. Enlarge infographics to use as posters and display them in waiting areas at healthcare centers, clinics, hospitals, courtesy vans for older adults, community centers, and libraries. Display information about low vision and vision rehabilitation after faith services or at social events. Demonstrate how to use visual and adaptive devices at these events. Encourage local health educators to incorporate information about vision rehabilitation services and devices into their existing programs, particularly those who serve older adults. Ask your state agency that serves people with visual impairment or your local vision rehabilitation agency to suggest a spokesperson who can give a speech at civic, employee, cultural, faith, and fraternal group activities. Arrange for the parks and recreation department to provide lighting for playing fields so that people with low vision can exercise safely. Have volunteers available to walk with people who need assistance. Use inserts in prescription bags, utility bills, bank statements, and shopping circulars to remind consumers to encourage people in their lives who may have low vision to talk with their eye care professional. During Low Vision Awareness Month, join efforts across the country to raise awareness about low vision and vision rehabilitation. Include a ready-to-go article, an infocards, an infographics, or a link to one of our videos in your organization’s newsletter, website, or blog and share with local media and partner organizations. You can extend your outreach efforts by using traditional media and social media. Both play an important role in spreading the word about eye health. 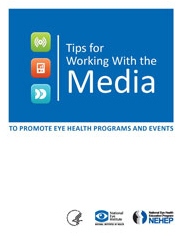 The following information will help you develop and implement a media plan to reach more people with low vision. Send the following materials to community newspapers and other local media to help raise awareness about vision rehabilitation. Follow us on the NEHEP Facebook and Twitter pages, share our videos on YouTube, and get some great ideas on the Low Vision Pinterest board. Find more low vision materials on our Resources page.